Corn is an inexpensive and versatile ingredient that is used to prepare a wide range of foods. According to FoodReference.com, more than 200 varieties of corn exist and all are good sources of vitamins A. While not common, a corn allergy will necessitate eliminating corn and foods made with corn from your diet so knowing which ones contain corn is a good way to avoid a reaction. High fructose corn syrup, or HFCS, is the most commonly used sweetener in processed foods, reports MayoClinic.com. With debate continuing on its safety, it is important to consider the wide range of foods that HFCS shows up in. Included are soda, condiments, packaged desserts, candy, granola bars, fruit snacks and cereal. Read labels if you are trying to reduce your sugar intake. HFCS could cause a reaction if you are allergic to corn, but the good news is that many manufacturers are beginning to remove it from their products, reducing the risk. Corn chips are sold at supermarkets nationwide and many people enjoy them for a snack. Brand names like Doritos and Fritos sell chips made from cornmeal. This adds corn flavor to the snack, while also giving it a crunchy consistency. Corn chips are sometimes healthier than potato chips and make a good snack when dipped in salsa. Homemade corn chips are often made by frying corn tortillas, which allows you the same snack, but without any added preservatives or colorings. White corn and yellow corn chips are available and the taste is similar. Many kinds of cereal are made from corn, including Corn Chex, Cornflakes and Kix. According to Dr. Mirkin, cereals made from corn typically contain both refined grains and whole grains. When choosing a healthy corn derived cereal, it is important to watch out for high sugar content so read labels before making your selection. Dry corn cereal makes a good snack or addition to trail mix because it is generally low in calories. 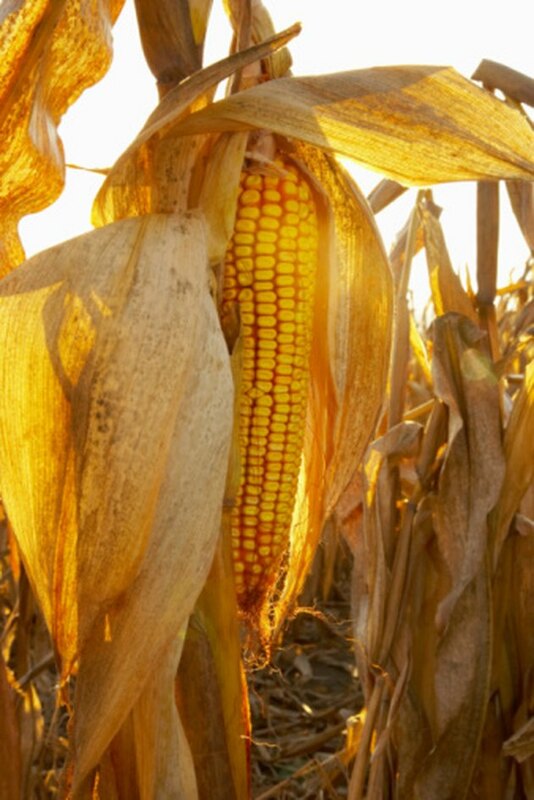 Most kinds of whiskey are produced using corn ingredients. A Canadian type whiskey is generally 90 percent corn, 5 percent rye and 5 percent barley malt, according to the Ontario Corn Producer. Corn whiskey was produced because of the over abundance of corn and it doesn't have to be aged in wooden barrels, making it faster and less expensive to produce. Whiskey that is made from corn is less expensive than other kinds and often has a stronger and sweeter taste. Ontario Corn Producer: A Zillion Uses for Corn!